One of the reasons I especially wanted Blondie to join me in this challenge is that she's done a fried fish taste off before between Burger King and McDonald's. This was several years back and Mickey D's was the clear winner in her book. 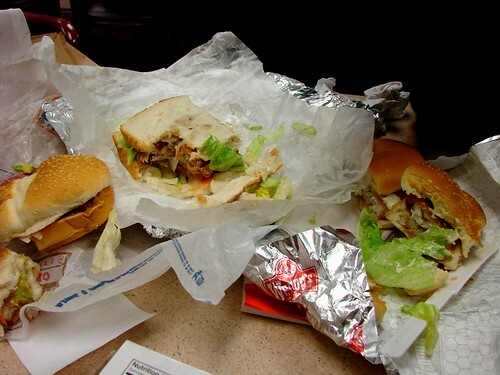 For me, the McDonald's vs. Burger King fish sandwich challenge was decided in high school. Every Friday afternoon was yearbook day and as the co-Editor-in-Chief, I had to make sure the staff was fed. During most of the year that meant porchetta or roast turkey sandwiches from the local Italian deli, but during Lent it was fried fish sandwiches and fries and our allegiance was strongly in the pro-BK Big Fish camp. All of this is to say that Blondie and I entered this challenge with certain biases, but open minds. And we were both surprised with the results. First up, the McDonald's Filet-O-Fish®. 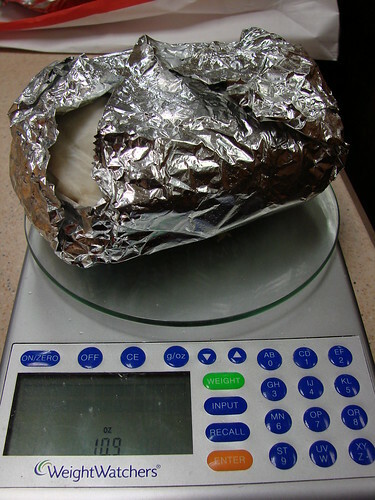 Probably the most famous of the options the Filet-O-Fish® weighed in at 5oz, 380 calories and 18 grams of fat. During Lent McDonald's tends to run Filet-O-Fish® specials. In Manhattan that means 2 Filet-O-Fish® for $4, or 1 Filet-O-Fish® for regular price which will run you a little over $4 with tax. Oddly enough in Brooklyn at the 9th Street McDonald's I saw 2 Filet-O-Fish® advertised for $3, just one more reason why Brooklyn is better than Manhattan, I suppose. Now to the sandwich...the bun was typical industrial McDonald's fare--squishy and not particularly tasty. And in my opinion the same could be said for the fish fillet. It left sort of a bitter and unpleasant aftertaste. If I were drunk, perhaps the grease from the Filet-O-Fish® might sop up the alchol and make this a more palatable option, but as long as I'm sober which is 99.9997% of the time, I'd give these a pass even with the cheaper Brooklyn deal. 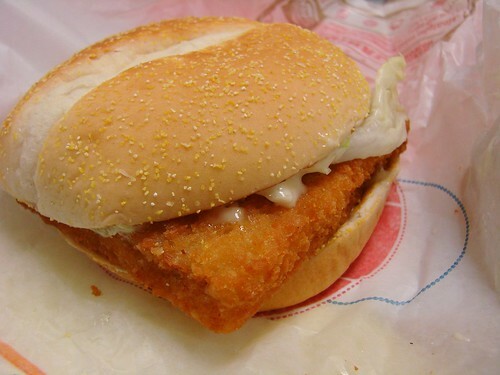 Next, the Burger King BK BIG FISH® Sandwich which weighed in at 8.75oz, 640 calories and 32 grams of fat. The bun was better than the one from McDonalds, it actually had a bit of bite to it. Blondie reckons that they changed their fish flavor chemical company to the same one as McDonalds because the taste seemed different to her. The fish flavor seemed different to me as well, sort of chemically lemony. 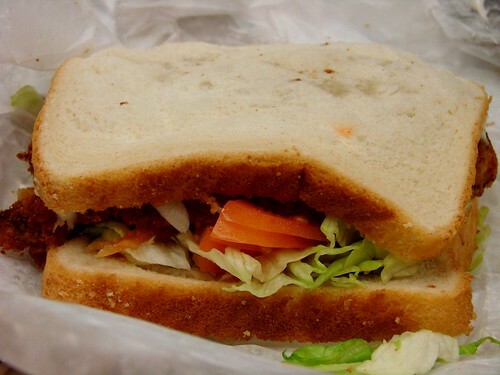 All in all better than McDonald's in my opinion, but my days of craving this sandwich ended when the yearbook wrapped. The Wendy's Fish Fillet sandwich was new to both of us. They've been pimping the "hand cut, panko breaded cod fillets" on late night tv for weeks so I was intrigued. This sandwich weighed in at 6 ounces with 470 calories and 24 grams of fat and was the most instantly appetizing of the bunch. The fish fillet looked crispy and golden, and it was. The bun was toothsome and the lettuce fresh. Though we both had our prior fried fish fast food allegiances, Blondie and I both had to admit that Wendy's really brought their A-game. This was hands down the winner of the fast food variety. A worthy lunchtime pick. The Wendy's Fish Fillet sandwich goes for $3.99 plus tax and is only available for a limited time. We got ours from the semi hidden Wendy's in the Rock Center concourse. 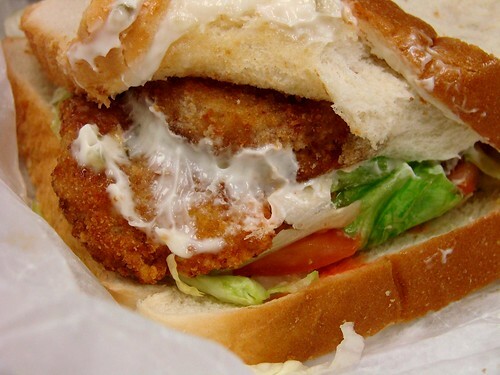 Last, but certainly not least, the fried whiting sandwich from Kim's Aunt cart. I've read much about this famous 45th Street cart staple, but for whatever reason, I've never given their food a try. I guess a long time ago I decided that as much as I love cart food, I wasn't going to eat fish from a cart. It was just a line I wasn't going to cross. But I did. Yes, dear readers, I did it for you. And I'm actually pretty glad I did, because Kim's Aunt's fried fish sandwich was the best overall. The fish was fresh and mild tasting (not overly fishy) and fried right there. You can have it on white or wheat bread--not the best bread, but pleasant if a little messy. This sandwich was a beast weighing in at 10.9 ounces (um, yes, I did weigh it on a Weight Watchers scale) and packed with fish. If you don't have a huge appetite you could definitely share this with a friend and both come away satisfied. And if you do have a huge appetite, I have a feeling you'll like both the size and the $3.50 price tag. Totally worth it. This is a sandwich that I'll definitely go back for. Kim's Aunt Kitchen seems to have switched from a bun to plain white bread, but I'm happy that in nearly two years they haven't raised the price. That Kim's Aunt one looks awesome! Great battle royale. Cranberry on 45th btw 6th & 7th has fried fish sandwiches on fridays - they are fan-fu*king-tastic. Slightly more expensive, but still great - do yourselves a favor and check it out. The Smith on 3rd Ave has an amazing fish sandwich. It is worth checking out. 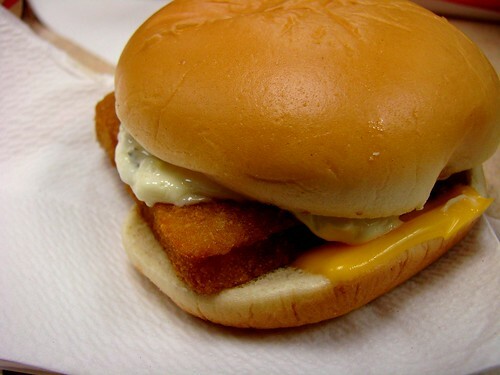 2 filet-o-fish for $3 is special running every else outside of manhattan thru 12 apr. You can still get the kim's fish sandwich as a hero - last time I checked it was the same price, and better than the white bread. 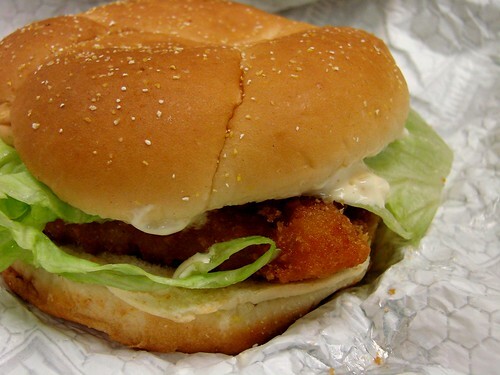 You should have added KFC's fish snacker in the running with the fast food joints. Although Kim's would have won overall anyway, you'd never know where it would stand. I agree, the McDonald's fish sandwich should be given a pass. I fell for the 2 for $3 low price.